— Reach out and ask for help; campus resources are available to students, faculty and staff. — Leadership UCO Applications due, 5 p.m. Contact Jakey Dobbs. One of the hallmarks of social wellness is being inclusive, not exclusive, with our friendship. 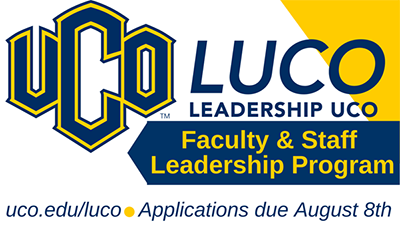 Leadership UCO Applications Due Today — Professional Development announces the launch of the revised Leadership UCO (LUCO) program. Full details on the LUCO program may be found online. For more information, email Jakey Dobbs. Applications are due by 5 p.m., today, Aug. 8. The Oklahoma Teachers Retirement System will be conducting pre-retirement planning sessions from 8:30-10:30 a.m. and 11 a.m.-1 p.m. on Saturday, Oct. 13, at Francis Tuttle Technology Center, Rockwell Campus. Subjects will include retirement eligibility, benefit calculations, partial and lump sum benefit options, post retirement employment and more. Register online. Seating is limited. The Edmond Community Chorale is looking for singers to join a collaboration between UCO and the Edmond/OKC community. Rehearsals will be from 7-9 p.m. Tuesdays beginning Aug. 21 in room 135 in the Music Building. In early December, the group will perform “Gloria” by John Rutter and selections from the “Many Moods of Christmas." It’s not necessary to be able to read music; experience participating in a choral group is helpful. For more information, email Cia Verschelden or call 405-974-2539.